How in the world is it already the end of August?! I guess my New Years resolution to write at minimum one blog post to my site each month was not a success. Instead of looking back and going “What the heck Jess? !”, I am just going to start fresh and move forward. A lot has taken place in the first half of this year already, and things are not about to start slowing down. * I was promoted to Supervisor of my Project Management Office at my work at the end of 2017. I am still feeling out my groove with that role. I am now managing 3 other project managers on top of working my assigned projects. I am also working on further developing our PMO, which includes performing performance reviews of my employees, developing training topics, and refreshing all of our templates. It is quite an undertaking. * I have been working off and on on a new sweater pattern that I hope to finishing the sample knitting within the next month. I say month, because I work full time and I also take care of my family. I also have been working on gift knitting as well which takes time. I’m ready to bind off the bottom of the sweater and then I just need to work on the sleeves. * Gift knitting, I have been working on holiday and baby gift knitting. I’ve knitted so many baby blankets I have the pattern memorized now! 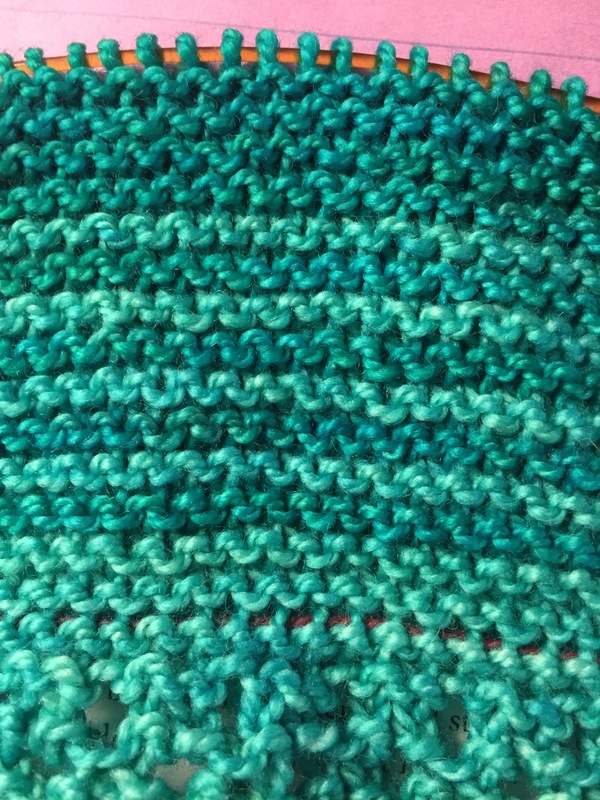 While I love knitting for little babies, I could use a break in the baby blanket knitting. * I’ve invested in some Craftsy online classes for pattern design and writing. I also purchased a class for sizing (grading) my clothing patterns into the various sizes smaller and larger than my sample that I knit for myself. Once I make it through all of these classes I hope to write a review post of each one. I was very excited to find these classes to help expand my knitting skills. * We took a family vacation to Colorado this summer and it was wonderfully relaxing. We had several days of relaxing at the cabin, adventuring in the mountains in the Jeep, and of course visiting yarn shops. Expect to see some new “Places You can Knit” pictures coming soon. Now to present day, my daughter is starting first grade this year! I cannot hardly believe it! This mama is having a hard time with how fast my baby is growing up. We have all the school supplies purchased and labeled. We have organized her room (expect the closet still needs to be addressed) and set up a desk and computer for homework. We have meet the teacher this Thursday and then first day of school on Tuesday after Labor Day. Stay tuned for first day of school pictures. Okay, so I am planning on making some minor changes to my website by adding some non-knitting content. I want to add reviews of products that I love (both knitting and non-knitting) and also include planning and organization type posts. Keep an eye out for those coming soon. I want to do better with my website by posting more regularly and expanding the topics that I talk about. If anyone has any ideas or suggestions on topics you would like to see show up on my site please don’t hesitate to send me a note! Hello, my name is Jessica and I am a serial project starter. One thing has become very clear to me over this past year. I have way too many knitting projects on the needles. While I have not documented the exact number, off the top of my head I can thing of 3 cardigans (one is an original design I am working on), 2 blankets, 1 kids sweater for my daughter, 3 hats, 4 cowls (2 of them are original designs), a cotton market. bag which is going to be a Christmas gift, and a couple shawls. I’m sad to say I’m sure that is not all of it. I get drawn in and carried away with the joy and pleasure casting on for a new project brings. I seriously do not have any self control when it comes to this. I’m currently fighting the urge to cast on the Fox Paw scarf kit I ordered from Craftsy on their Black Friday special. It’s a sickness I tell you! Adding to this sickness is my desire to learn and expand my knitting pallet by learning new techniques and skills each year. This year I mastered short rows and sweater construction. Next year will be the technique used in the Fox Paw scarf and steeking (which I am terrified yet determined to do). I’m sure I am not the only knitter with the problem. I read posts on Facebook that other fellow knitters have posted about only being able to focus on one project at a time. I can’t decide if I envy them or feel sorry for them. I wonder how they manage to do it. Especially if they have lots of patterns in their library and the yarn to go with them. I’m trying very very hard to not start another project until I have completed at least half of the projects I have on the needles. I know this will not be accomplished before 2018 rolls around. I am going to make it my first resolution of 2018 to complete all of my in progress projects before Thanksgiving. This is going to be a difficult task, but if I want to get my knitting under control and stop the feeling of drowning in projects I need to stick with it and get it done. In addition to my knitting addiction, I also have my spinning wheel and weaving loom that demand attention. To be able to attend to those addictions, I need to get my craft studio all cleaned up and super organized. Another resolution for 2018. I have such grand ideas and plans for the new year. I’m looking forward posting about my progress throughout next year. Anyone else suffer from the same affliction? I’d love to hear your story! I’d also love for you to join me in this venture next year to free ourselves from all of these partially done projects, so we can cast on for new ones!!! Celebrate Fall with a Discount! Fall is finally here! It is my favorite season. When people ask what my favorite color is I usually say Fall. I love the browns and yellows, oranges and bright reds! To help celebrate my favorite season I am running a special promotion in my Ravelry pattern shop Jess Knits. Use the code FALLROCKS to receive a 30% discount on any and all patterns in my shop. This promo code is good through October 1st. I’d love to see more of my patterns knitted up on Ravelry. Right now my shop is relatively small but I have several designs in the works. Plus I am working on updating my very first few patterns and putting into my new pattern template. 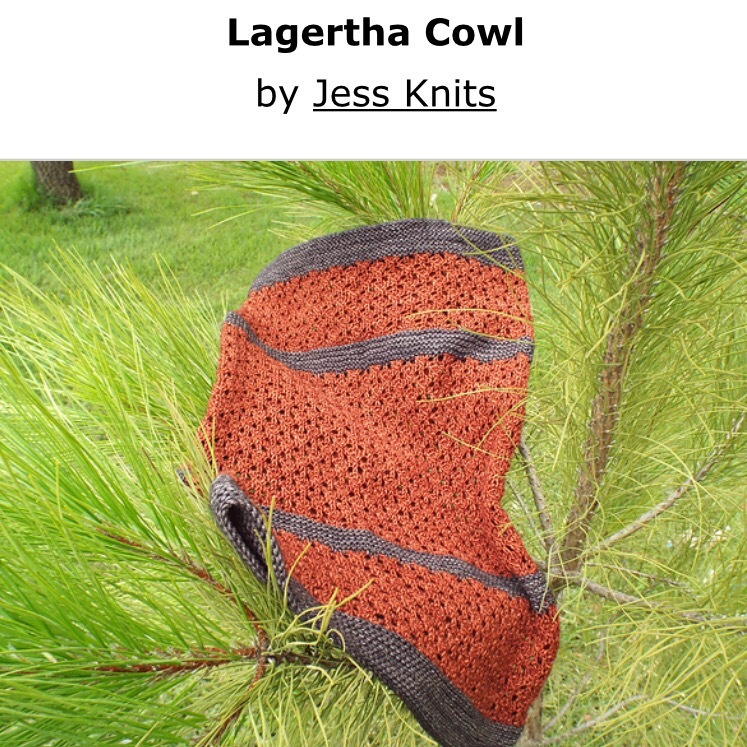 I finally published a new pattern to my Jess Knits Ravelry shop. Lagertha is a nice a squishy cowl pattern knit in the round with sections of lace and garter stitch. I’m so very pleased with the way this pattern turned out. It’s also the first pattern using my new pattern template with my new logo on it. I’m super excited to share it with you! You can check out the pattern page here. I used 2 skeins of Malabrigo sock yarn. Yes, I am a Malabrigo junkie! Their yarn is so soft to knit with and really comes alive when you soak it for blocking. Wet Malabrigo is as soft as butter! I love it! I used the Eggplant color for the garter stripes and Botichelli Red for the lace. I really think those two colors complemented each other really well. Kind of rustic. This was a summer time knit, so I’ll have to get some pictures of me wearing it this fall. I really hope those who choose to purchase this pattern enjoy knitting it. As always comments and questions can be emailed to my jessknitsdesigns@gmail.com email address. What a long week that was….. I don’t think I have ever been more thankful for a Friday than I am today. I’m not sure what was different about this week but it has left me mentally exhausted and weary. Most nights after work this week I didn’t even have an ounce of energy left to knit. It becomes a pretty sad state of affairs when you don’t have enough energy to do one of the main things that helps you relax and destress. I’m hoping to gain my knitting mojo back over the weekend. Side note, the LCD screen I ordered to replace the broken one on my laptop arrived the other day. I was really excited until I learned that it was the wrong one. Apparently I should have let my hubby double check the model before I actually ordered it. So that one will be shipping back tomorrow. Hubby ordered the correct one, which hopefully will arrive tomorrow. Live and learn, I guess. 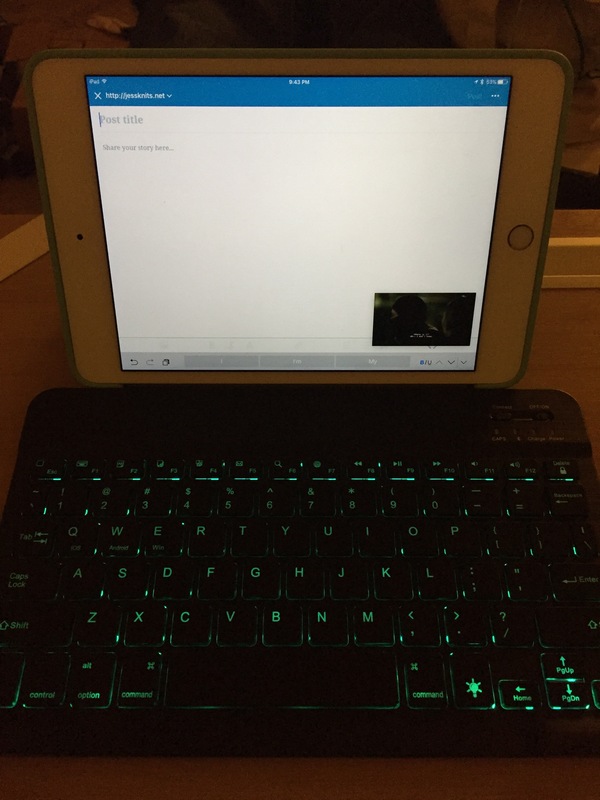 In the meantime, I am improvising with my iPad and a Bluetooth keyboard. On the updside the keyboard has a backlight and I can choose from 7 colors! I am currently enjoying a teal color. I can even multi-task and watch an episode of Arrow while typing up this post. As frustrating as technology can be I have to admit that I love my little technology gadgets. I have been able to do little bursts of knitting during lunch at work a few times this week. And I did do several rows this evening. I’ve made it to my third color on my Fade Shawl. I am seriously loving these colors. I am definitely in a mint green / teal mood here lately. I want everything to be in mint and teal colors. They just calm me. They are refreshing to my eyes. I think I will make some fingerless mitts with the leftover yarn from the Fade shawl project. Here’s the latest color, it is another Madelinetosh color called Nassau Blue. It’s a nice teal color with hints of green in it. This is the color meld section going from Glass Bottom Boat to Nassau Blue. It’s a subtle difference between the two colors. But one is just a hair darker than the other. I don’t know if I will get another post in next week or not. My baby is turning five on May 10th, and we have weekend birthday celebrations planned. I cannot believe it has been five years since I brought my baby girl home from the hospital. She has been such a joy. She is basically my world, and while I am happy to celebrate her 5th birthday I am also a little sad that she is no longer a baby. She is just growing up so fast my heart aches just a little. I hope everyone has a safe and wonderful weekend fully of yarnie goodness.